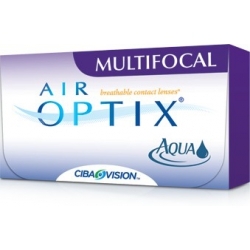 Air Optix Aqua Multifocal from CIBA Vision are the latest addition to the Air Optix contact lens brand. 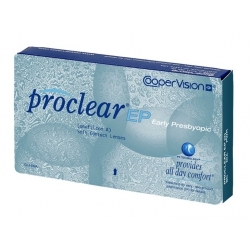 This presbyopic lens system with 3 ADD powers is designed to successfully fit and smoothly transition you through the different stages of presbyopia so that you can stay in contact lenses longer. 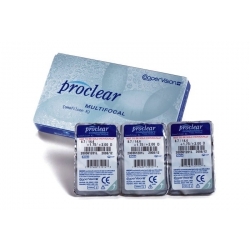 With a number of innovations such as the new Precision Transition Design and the unique plasma surface treatment, Air Optix Aqua Multifocal contacts promise to provide superior comfort and wettability. A 30% lower contact angle (compared to Air Optix) increases wettability. For additional wearing comfort, a unique wetting agent (with hydrophilic properties) lets the eyelid easily glide over the lens. The unique Aqua Moisture Systam allows up to 5 times more oxygen through the lens than traditional hydrogel soft multifocal lenses. The result: Whiter, healthy looking eyes. An aspheric back surface design provides optimal centration and excellent fitting characteristics. 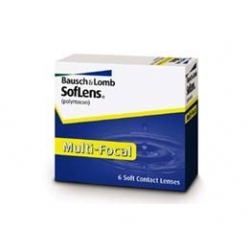 The plasma treated lens surface resists deposits and a unique moisture agent binds with the lens surface to create a more silky layer. 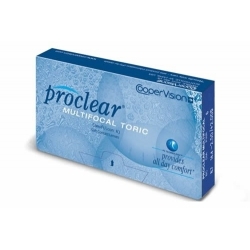 What else should you know about Air Optix Aqua Multifocal? The standard diameter is 14.2 mm. The base curve is 8.6 mm. Available powers range from +6.00D to -10.00D in 0.25 increments. Available ADD Powers are Lo, Med and Hi. 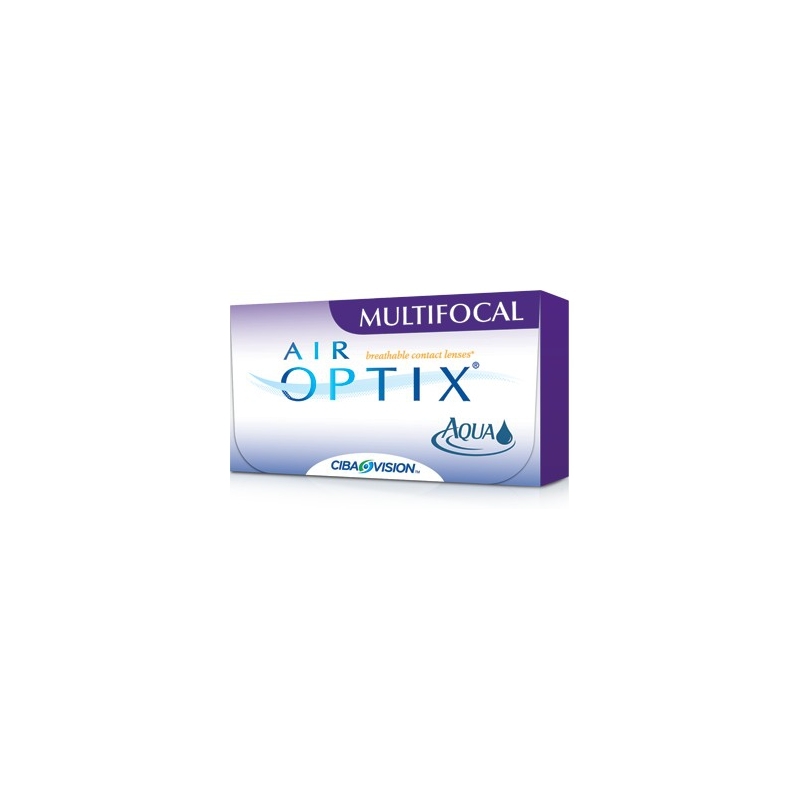 Air Optix Aqua Multifocal are disposable soft contact lenses. The replacement schedule is 4 weeks based on daily wear with up to 6 nights extended wear. 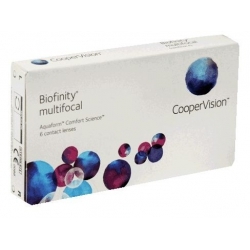 Air Optix Aqua Multifocal Contacts are made of 67% polymer (L otrafilcon B) and 33% water. The non-edge corrected Dk/t value is 138. The non-edge corrected Dk value is 110. The center thickness is 0.08 mm at -3.00D. 1 box contains 3 visibly tinted lenses. 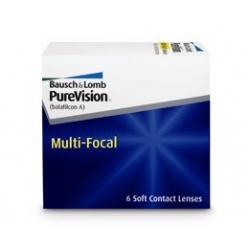 Each contact lens is shipped sterile in a blister pack containing a phosphate buffered saline solution. CIBA Vision, a Novartis company. 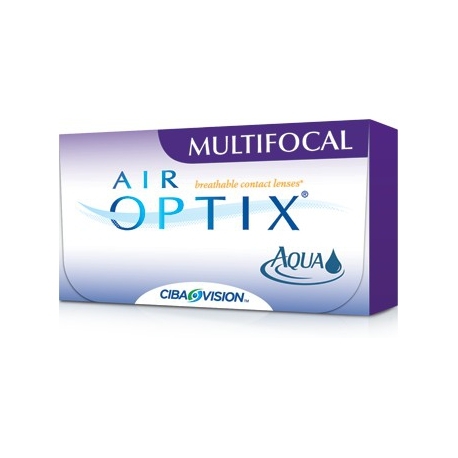 Air Optix Aqua Multifocal was introduced in January 2009.